Johann Strauss II: Die Fledermaus Overture Die Fledermaus (The Bat) is an operetta composed by Johann Strauss II to a German libretto by Karl Haffner (de) and Richard Genée. Johann Strauss II: Polka-Mazurka “Frauenherz” The polka-mazurek is a dance, musically similar to the mazurek, but danced much like the polka. Many polka-mazureks were composed by Johann Strauss II and his family. Johann Strauss II: Im Krapfenwald’l Im Krapfenwald’l (In Krapfen’s Woods) op. 336 is a polka by Johann Strauss II written in 1869 and was originally titled ‘Im Pawlowsk Walde’ (In the Pavlovsk Woods) when first performed in Pavlovsk on 6 September (= 25 August Russian calendar) 1869. 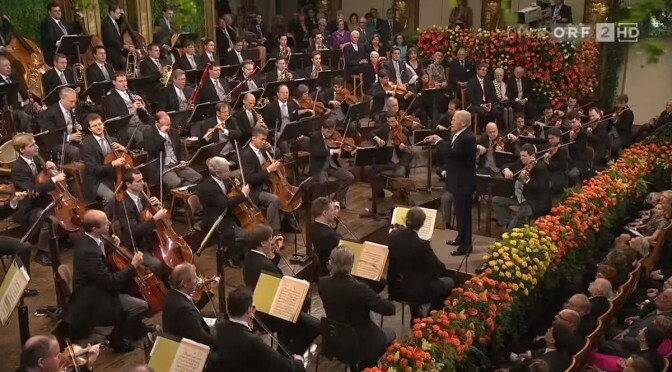 Reportedly, several encores of the piece was called for and Strauss felt moved to retitled the piece to suit his audience back in native Vienna. The new title ‘Im Krapfenwald’l’ alludes to the popular Krapfenwald area of the Wienerwald located in the scenic village of Grinzing and the heights of Cobenzl and Kahlenberg. The piece may also refer to the owner of the local tavern ‘Krapfenwaldel’, Franz Josef Krapf who opened his establishment at the same area. Eduard Strauss, who was responsible for performing many of his elder brother’s works dating from his Russian tour first performed the work in Vienna at the Vienna Volksgarten on 24 June 1870 where it enjoyed greater admiration. The work which hints strongly at the Viennese Woods backdrop calls for bird whistles which adorn the polka. Strauss has the last laugh when he calls for one of these birdsong in the closing moments of this cheerful work before a rushed ending with percussions and a flourish. Johann Strauss II: Wein, Weib und Gesang (Wine, Woman, and Song), Op. 333, a waltz by Johann Strauss II. It is a choral waltz in its original form, although it is rarely heard in this choral version today. Otto Nicolai: The Merry Wives of Windsor (in German: Die lustigen Weiber von Windsor), an opera in three acts by Otto Nicolai to a German libretto by Salomon Hermann Mosenthal based on the play The Merry Wives of Windsor by William Shakespeare. Johann Strauss II: Wiener Bonbons (Vienna Sweets) op. 307, a waltz by Johann Strauss II written in 1866. It was first performed on 28 January 1866 at the ball of the Association of Industrial Societies held in the Redoutensaal and was dedicated to the influential Princess Pauline Metternich-Winneburg the wife of then Austrian ambassador to Paris. Johann Strauss II: Champagner-Polka, Op.211 Strauss wrote his Champagne-Polka for the season of summer concerts of 1858 to be held in Pavlovsk, near St. Petersburg, where it was performed for the first time on 12 August of the same year under the title -Ball Champagner- Polka. Johann Strauss II: Ein Herz, ein Sinn! (One Heart, one Mind! ), opus 323, a polka-mazurka composed by Johann Strauss II in 1868 belonging to a period of creativity of the composer. Strauss dedicated this piece to ‘the Committee of the Citizen’s Ball’ which was held at the Imperial Redoutensaal on 11 February 1868 where on occasion he had earlier also dedicated his waltz Bürgersinn (op. 295). On 19 February 1838 the Theaterzeitung (No. 36) announced the appearance of Carnival in Paris from Tobias Haslinger: ‘This galop bears the stamp of originality. French vivacity is combined with German geniality. Particularly lovely is the first part of the trio, with the second part an irresistible invitation to the dance.’ Little can be added to this verdict of a contemporary. After four introductory bars the galop begins with a lively motif, followed, after the repetition, by a charming melody in the second part. It continues with spirited passages of sixteen bars respectively that can certainly be described as ‘an irresistible invitation to the dance’. Jacques Offenbach: Die Rheinnixen Overture (English: The Rhine Nixies), a romantic opera in four acts by the German-born French composer. The original libretto by Charles-Louis-Etienne Nuitter was translated into German by Alfred von Wolzogen. Johann Strauss II: Morgenblätter (Morning Journals) op. 279, a waltz composed by Johann Strauss II in 1863. The work’s genesis was attributed to the composition of another waltz by Jacques Offenbach later titled ‘Abendblätter’ when the French opera composer dedicated his work to the influential Vienna Authors’ and Journalists’ Association (‘Concordia’). The Association had earlier intended the ‘Abendblätter’ waltz (untitled by Offenbach when first dedicated) to be played at their ‘Concordia Ball’ on 12 January 1864. Hans Christian Lumbye: The Champagne Galop (Danish: Champagne-Galoppen), a piece of orchestral music by the Danish composer Hans Christian Lumbye (1810–1874) which was written to celebrate the second anniversary of Copenhagen’s Tivoli in 1845. Johann Strauss: Radetzky March, Op. 228, a march composed in 1848. It was dedicated to the Field Marshal Joseph Radetzky von Radetz and soon became quite popular among regimented marching soldiers. It has been remarked that its tone is more celebratory than martial; Strauss was commissioned to write the piece to commemorate Radetzky’s victory at the Battle of Custoza.